In the wake of the Ottoman Empire’s nineteenth-century reforms, as guilds waned and new professions emerged, the scholarly ‘estate’ underwent social differentiation. Some found employment in the state’s new institutions as translators, teachers and editors, whilst others resisted civil servant status. Gradually, the scholar morphed into the public writer. Despite his fledgling status, he catered for the public interest all the more so since new professionals such as doctors, engineers and lawyers endorsed this latest social role as an integral part of their own self-image. This dual preoccupation with self-definition and all things public is the central concern of this book. 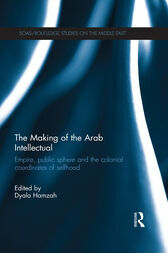 Focusing on the period after the tax-farming scholar took the bow and before the alienated intellectual prevailed on the contemporary Arab cultural scene, it situates the making of the Arab intellectual within the dysfunctional space of competing states’ interests known as the ‘Nahda’. Located between Empire and Colony, the emerging Arab public sphere was a space of over- and under-regulation, hindering accountability and upsetting allegiances. The communities that Arab intellectuals imagined, including the Pan-Islamic, Pan-Arab and socialist sat astride many a polity and never became contained by post-colonial states. Examining a range of canonical and less canonical authors, this interdisciplinary approach to The Making of the Modern Arab Intellectual will be of interest to students and scholars of the Middle East, history, political science, comparative literature and philosophy. "This compilation presents a very rich analysis of the intellectual profile of the Arab World, which was lost somewhere between history and historiography. In addition, this book reintroduces the Jewish contribution to the Arab intellectual movements, which was almost forgotten." Dyala Hamzah is Assistant Professor of Middle East History at the Université de Montréal. She holds an M. Phil. in Philosophy from the Sorbonne and a Ph.D. in History and Islamic Studies from the Freie Universität Berlin and the EHESS (Paris). She is currently completing a book entitled Muhammad Rashīd Ridā (1865–1935) ou le “Tournant Salafiste”. Intérêt général, Islam et Opinion Publique dans l’Egypte Coloniale.